Prototype: Privately owned small diesel locomotive painted and lettered for RTS Rohr-Transport-GmbH, Duisburg, Germany. Former Köf II / class 323 used on the German Federal Railroad (DB). Version with an enclosed engineer's cab. 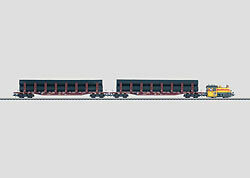 2 German Federal Railroad (DB) type Snps 719 stake cars. Model: The locomotive has a digital decoder. It has a controlled miniature can motor with a flywheel. 2 axles powered, 2 track adhesion magnets for greater pulling power. The headlights and marker lights will work in conventional operation and can be controlled digitally. The locomotive has separately applied metal grab irons. The stake cars have fixed double stakes with tension levers. Both stake cars are loaded with black pipe with a slightly rusty coloring. The cars have different car numbers. Total length over the buffers 57.2 cm / 22-1/2". Special magnets for greater pulling power on Märklin track. Maintenance-free LED's for red marker lights / white headlights.